The Sloaney team love a good pub meal. As winter arrives, there is nothing better than spending Saturday lunchtime or evening in your favourite local, next to a warm fire and enjoying hearty British food. Although winter may not have fully arrived, it was certainly a cold and miserable day when we visited Red House in Chelsea. This large but charming pub welcomes you with a roaring fire in the dining area and has an inviting dark interior that features olive green leather booths. It caters well for both intimate dining or drinks with a group of friends as the restaurant area is separate to the busy bar. 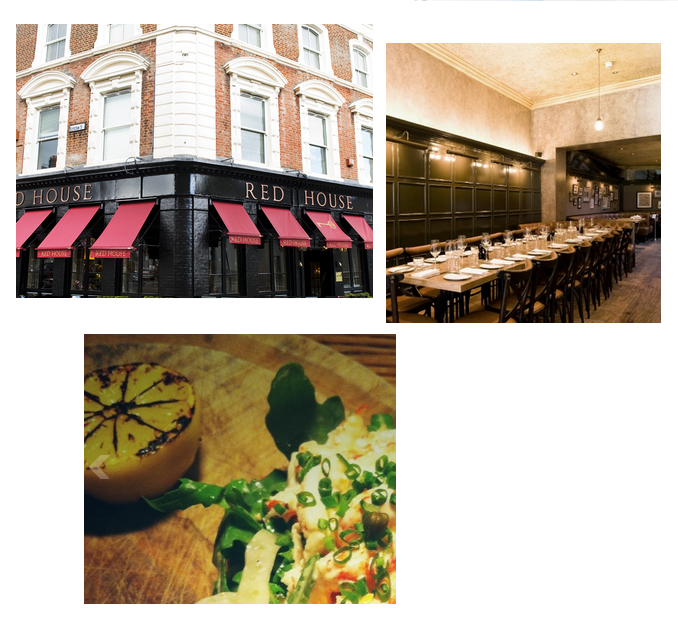 Tucked away from the Kings Road on Chelsea Green, Red House is a venue frequented by those in the know and manages to avoid any tourist hype that surrounds this famous neighbourhood. The menu includes many national favourites, such as a Prime British Beef Burger, Wild Sea Bass, Chicken Salad and Friday favourite, Fish and Chips. Steaks are also available with the warming pasta dishes certainly an appealing choice as the temperatures outside drop. If you are feeling extra peckish, it is worth having a starter before progressing to your maincourse and these include Beetroot and Goats Cheese Salad, Chicken and Foie Gras Parfait and Soup of the Day. The wine list offers a good selection of white, rose and red, with Moet and Chandon the house champagne. British sparkling wine, Nyetimber, is also available or Billecart-Salmon and Ruinart for those wanting to sip something extra special. The Chablis proved a good choice from the selection of white wine and Pinot Noir by the glass was also popular with diners. All in all, Red House caters well for those looking to enjoy a traditional pub experience. It has been named after the Victorian Public House that sat in the same location and the peaceful situation makes it ideal for hiding away from hectic city life.